You wouldn’t be Josh Frydenberg for quids. He has Victoria, Queensland and the ACT all dubious about the NEG being not ambitious enough on emissions reduction. Tony Abbott is on 2GB saying we should pull out of the Paris Agreement. Barnaby Joyce has said he won’t support the NEG if higher emissions reductions pressure is placed on agriculture. The ACCC is recommending that renewable energy subsidies should cease. The AEMO is reporting that renewables are the least cost plan for our energy future. Backbenchers Tony Pasin, John Williams, Ken O’Dowd, Craig Kelly and George Christensen say the report is biased and have criticised the head of the AEMO personally. The Minerals Council has sent George Christensen and Craig Kelly over to Japan to deliver a letter from Matt Canavan to order some new coal-fired power stations. George says on Facebook that he ordered one and Craig says he ordered three. Good luck sorting that out. Why in God’s name is the ACCC is recommending that renewable energy subsidies should cease? Are they too, owned by Coal? “If governments want to subsidise solar panels, that’s absolutely fine, but they should be doing it from their budgets,” Mr Sims said. The report said households with solar energy had benefited from generous feed-in tariffs, and also received subsidies for the installation of the system itself through the Small-scale Renewable Energy Scheme (SRES). “Meanwhile, non-solar households and businesses have faced the burden of the cost of premium solar feed-in tariff schemes and the SRES,” the report said. The ACCC recommends that any costs remaining from premium solar feed-in schemes should be borne by state governments through their budgets, as Queensland has done, rather than being recovered through charges to electricity users. The report also recommends the SRES should be wound down and abolished by 2021 to reduce its impact on retail prices paid by consumers. I think it’s wonderful and I don’t feel sorry for any of them. They deserve at least as much discomfort as they have been meeting out to the poor, the jobless, the Indigenous and the refugees off our shores. There will be no way out of this. The election has got to happen before May 18 next year if they want to tie it to the half Senate election. God help them if they don’t – that will be really be a massacre if they make the Australian people go to the polls twice in the same year along with the inevitable debacles that are ratcheting up within the LNP. The screams of ‘Labor liars’ will get louder and ever less convincing. With any luck they’ll keep plugging away at the tax cuts for the big banks and non tax paying conglomerates. Turnbull won’t stay if he thinks he has no hope of winning and we can all have a bit of a look at what life would be like under Herr Dutton prior to the final undoing. I look forward to watching the MSM try to spin it all into something acceptable or pretend they never supported the born to rulers ever while at the same time lamenting – if only the party had been nicer to poor Malcolm! – what a comedy it will be. There will be no furniture to save – no doubt about the hiding they’ll get at the ballot box and then hopefully the healing can finally begin. Barnaby isn’t happy with the NEG if farmers have to cut emissions ! “If we go down that path, then forget it. I’m out. See you later. Goodbye. Because that’s just nut case stuff,” the former Nationals leader said. Could somebody get that in writing, please. @Terence; Barnyard was reported as making a rare trip down to the local supermarket this week, nearly tripping over his jaw in the process. Barnyard may threaten an early retirement, but think about the facts; a paramour wanting the good life of the financially sound squattocracy, a divorce settlement to come that may cost him one or more of his retirement properties in the Santos CSG leases, so removing Barnyard from the financial drip-feed of the Parliamentary Allowances Scheme will not happen on a matter of COALition principle. Poor little lamb, how would Barnyard survive the domesticity of a young baby when he cannot sashay around the country at taxpayer expense masquerading as an knowledgeable person representing the best interests of his electorate? 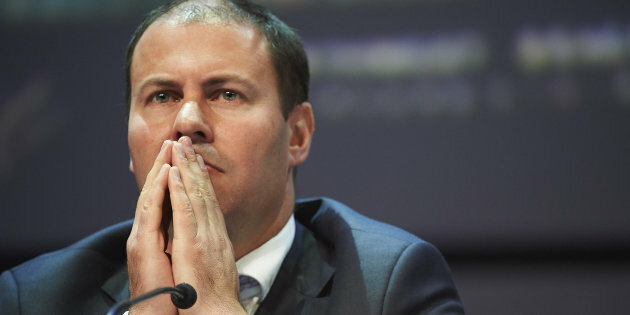 As for the others in the gang of National$ backbenchers I would not expect them to do much more than make a quiet noise because they know that there are large scale solar farm investments being located in New England and other regional centres to generate cheaper electricity than the 19th century coal-fired polluting monsters. The real problem is that the kiddie scribblers pretending to be investigative journalists in the MSM are giving these characters too much air time and free publicity because it is easier to copy out their press releases as demanded by the US citizen who controls about 70% of Austrian mastheads, that to analyses the many policies of the ALP. Is there nothing this inept, lying bunch of so-called liberals/nationals will not do? It seems they are ALL flat Earth, climate change denialists! As long as Labor get sin at the next election we will have some hope of “normality” being used to ensure that some steps will finally be taken to ensuring that Australia does its bit towards helping to slow etc any climate change events. Well written article, as usual, Kaye! God help us all if the effing libs etc regain power! What should cease immediately is the subsidies given to coal. Renewables are the future and should be subsidised to assist everyone to get on board. Nor would I trust Friedburgers and his promise to review emissions targets in 2024. He and his government have more than proven they can’t be trusted. Once josh gets his national energy guarantee through he will start working on his national environment guarantee. Really can’t wait for that. Is it my imagination or is Trembles and Fascist Incorporated starting to lose it big time? Morrison really is a piece of work. Meanwhile….Tony Abbott rubbished the NEG for doing too much, saying “pigs might fly” when asked about claims the scheme would reduce prices. It’s not the Labor Party that’s causing grief Scott. Morrison really is a piece of work. Hardly a parliamentary speech, policy statement, presser or an answer to anything goes by without him framing it as an attack against Labor. Indeed this government, as they did in opposition, spend more time and resources, including politicising the public service, in attacking Labor and their source of funding, the unions, than they do in running the country and producing sound policies. Even their policies are framed to wedge Labor instead of being framed as being good for the nation. A tactic exacerbated by Howard and expanded by this L-NP mob. Then there are Morrison’s glaring lies the media never pick up on. An example, yesterday in a presser as a boast he claimed the current housing situation is EXACTLY as predicted in his last budget. Not one journalist pulled him up on that statement or asked him where in the budget that phantom prediction was made. I know they all lie, and most especially this L-NP who have raised blatant lying to a whole new level up there with Trump. Morrison stands out in flagrant lying with a bravado that dares listeners to out him on them at their peril, and to their shame his audience outside of social media never challenge him.